Good Morning y'all! To preface this post, let me start by saying, I like cake. Not in an obsessive sort of way, but I just love the anticipation that goes with the baking, cooling, decorating and then finally sinking your fork into the mountain of deliciousness... I know you understand what I'm saying here, cake is one of the most famous types of desserts and the options are endless. With all that said, I don't make cake all that often. It's tedious at times and takes a lot more time and energy than this Momma has most days, plus the constant "Mom, is it done yet? Oooo... I want some now! No I don't want to wait for it to cool!" kinda wears you down... But every once in awhile I decide to whip out the inner Martha and bake a cake, however when this urge comes a box won't do. It's homemade all the way for this girl! Separate the eggs, and let the egg whites come to room temperature for about 30 minutes. Grease and lightly flour a 9x13 pan and set aside. Then in a medium bowl whisk together flour, baking powder and soda, and salt; set aside. In a large mixing bowl beat the shortening with your electric mixer on medium-high speed for about 30 seconds, then add the sugar and vanilla until combined. Texture will be crumbly but will come together in your fingers. Next add in one egg white at a time until fully combined, then slowly start incorporating the flour mixture, alternating with the sour cream and buttermilk. Spread into the prepared pan, and bake at 350F degrees for 30 minutes or until toothpick inserted in the center comes out clean. Remove from the oven and let cool. While cooling, mix your jello according to package directions. Poke holes all over the cooled cake with a knife or fork, and pour the jello evenly over the top. Cover and refrigerate overnight. 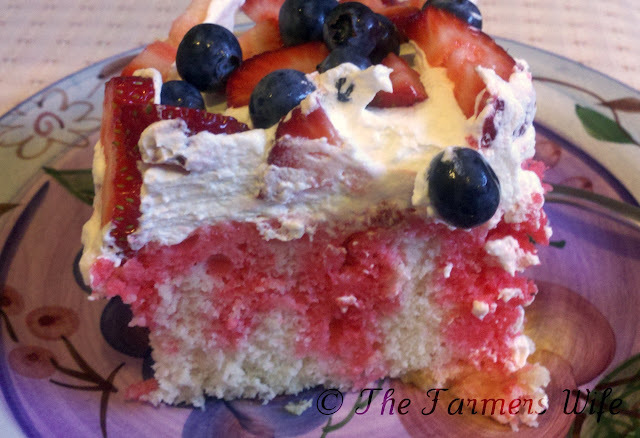 Top with cool whip and fresh berries. We LOVED this! I made it for the Fourth of July this year, and it was such a huge hit. My little sous chef went to town on this and he's not a big cake lover, and so our company. The cake was EXTREMELY moist, possibly the moistest cake I've ever had... I highly recommend this, great for a kids party, or even for a family Barbecue! 5 Stars. P.S. Have you checked out the Giveaway going on right now? If not you should, it's my favorite kitchen items and I'm so excited to share them with y'all! It's going on until the 10th so head on over! Yum- the vanilla and raspberries sound great and the picture is just stunning. Bookmarked-buzz! Yum Kim, haven't seen one of these in years. My mom used to make it for us when we were little. Love the fresh berries on top. This looks SOOOO good! Wow...I am kind of drooling onto my keyboard at the moment..
What a great cake! Looks so good with all the colors and the cream - yum! Wow, it certainly looks great. Glad you decided to put in the time and make this cake! Looks awesome. Worth the effort! Looks totally delicious to me! Yummy! Looks so moist and delicious. My goodness...what a wonderful cake!! That looks yummylicious!! Thanks y'all!!! Your comments just make my day! We love this cake, it was so moist and amazing! Great for summer! Beautiful combo of colors but just like you, I love cakes and desserts but just a small bit of it. I'll bet the buttermilk makes it moist. I'm with you, I don't bake often, but when I do the recipe has to make it worth the effort. This one is! I heart the colors in this cake! Gorgeous! Looks like the perfect summer desert. Love the topping! I love what you did with this cake. The jello is definitely a cool ingredient. Yummy!